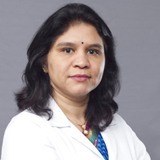 Dr. Vasavi Latha completed her MBBS from Gulbarga University, Karnataka, India followed by a Diploma in Dermatology from Kakatiya Medical College, Warangal, Andhra Pradesh, India. Dr. Vasavi Latha​’s work experience spans 16 years. She worked as a Consultant Dermatologist for 3 years in Aruna Skin Care Centre and a year in Image Hospitals in Hyderabad, India. Dr Vasavi joined NMC Specialty Hospital, Al Nahda as a Specialist Dermatologist in 2005. Her areas of Expertise are General dermatology, Cosmetic dermatology and Phototherapy. She takes keen interest in the latest updates on dermatology and actively attends national and international conferences and seminars. She is a member of IADVL. She currently practices as a Specialist Dermatologist in NMC Specialty Hospital, Al Nahda, Dubai.